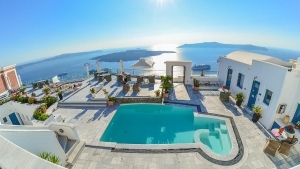 Amerisa Suites is a 4 star hotel, set on a hill in the east side of Fira, at a walking distance from town center and offering panoramic views of the Aegean Sea. 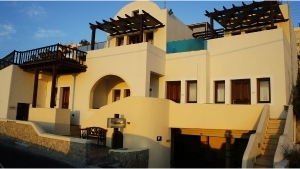 All rooms and suites are air conditioned and provide free wi-fi internet access and a satellite TV. Some of the suites feature hydromassage showers. Guests enjoy a rooftop swimming pool with sun terrace and hot tub. Upon request guests are provided with rental services, massage and beauty care services or travel arrangements. 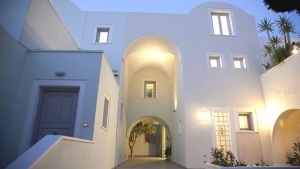 The hotel offers free transfer from Santorini airport or port of Athinios upon arrival. 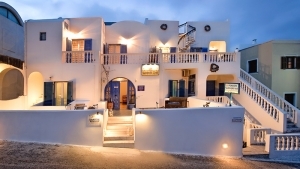 The hotel is 5 km away from Santorini Airport. Luggage Storage, Air Conditioning, Heating, Safety Deposit Box, Non-Smoking Rooms, Soundproofed Rooms, Express Check-In/Check-Out, Design Hotel, Terrace. Activities: Massage, Outdoor Swimming Pool, Hot Tub, Library. Services: Fax/Photocopying, Car Hire, Room Service, Dry Cleaning, Laundry, Tour Desk, Bridal Suite, Airport Shuttle, Souvenirs/Gift Shop.